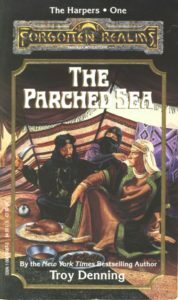 The Parched Sea – Let's Read TSR! Once TSR had wrapped up all of their outstanding trilogies in the first half of 1991, they needed something to fill the gap between them and the next batch of books from Salvatore and Niles. Thus “The Harpers“: an open-ended series of one-shot novels by various authors describing the struggles of the eponymous organization of do-gooders against their many foes. Frankly, I’m looking forward to reading some standalone books here that don’t bear the responsibility of carrying a trilogy. Some of the strongest novels in the Realms series thus far (Azure Bonds, The Wyvern’s Spur, Crusade) have been ones which, while ostensibly part of a trilogy, didn’t require reading any of their companion books to fully enjoy them. The constraint of telling a good story in just 300-odd pages forces an author to work harder on their plots and characters; you can’t kick the can down the road and assume that you’ll have time to fix the problems in future books. That said, I’m a little uncertain about the idea behind this inaugural book in the series. It’s more fantasy counterpart culture nonsense, transplanting another real-world culture (this time the Bedouins of Arabia) into the Forgotten Realms wholesale. Customs, language, everything — there hasn’t been even a halfhearted attempt to file off the serial numbers. Hell, they’re even called “the Bedine”! And it’s by Troy Denning, whose previous outing (Dragonwall) had a similar fantasy counterpart culture shtick which didn’t quite land for me. Will he fare any better this time around? Let’s find out. Not only the culture but also the general plot outline are lifted from elsewhere. Let’s play a game: I’m thinking of a classic book where an ethnic group of desert dwellers are being oppressed by a foreign colonial invader. Suddenly a white man shows up, learns their ways, teaches them how to fight their foreign oppressors, and eventually they win their freedom. What book am I thinking of? It’s a bit of a trick question, really. I expect most readers’ thoughts will immediately jump to Dune, but the book I have in mind is the one that Dune also ripped off: Seven Pillars of Wisdom, T.E. Lawrence’s autobiographical account of organizing an Arab revolt against the Turks during the First World War. 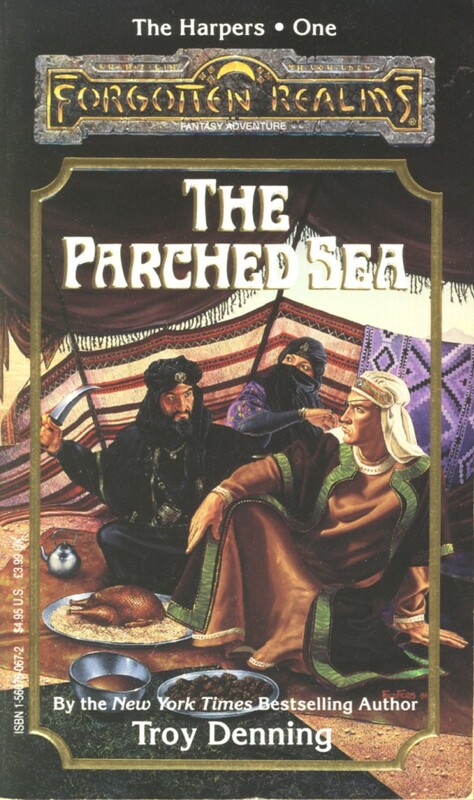 The short version: A blue-eyed white guy who represents a foreign power travels to the desert and learns the natives’ customs and skills well enough to win their respect. He’s able to unite the fractious tribes against their common enemy because he has a good mind for strategy and a superior understanding of the foe. There’s lots of hit-and-run raids, camel charges, and confused battle scenes. Every sentence in that synopsis also describes the plot of The Parched Sea. It doesn’t imitate Lawrence’s book in every particular, thankfully — at least, I don’t remember any man-eating lizard people in Seven Pillars — but there’s no doubt where the inspiration for this book came from. But despite being derivative, the plot is reasonably well-fashioned. Action and exposition scenes alternate in a pleasing fashion, the characters’ successes feel hard-earned, and they make decisions based on their personalities and backgrounds rather than being arbitrarily dragged around by the plot the author wanted to tell. There’s a good twist near the end, too, which I won’t spoil here. My only plot-related complaint would be the very abrupt ending; the story cuts off after about half a page of denouement. Ruha, the young Bedouin Bedine woman whose story opens our plot, is a fairly engaging character. A common mistake that authors make when describing a non-Western culture is to have the token “rebel” character who acts as a stand-in for Western values, disobeying those customs which seem odd or unpleasant to Western readers. Denning’s Dragonwall provides a good example: Wu, Batu’s wife, a strong and independent woman who spends the whole book violently refusing to conform to her society’s restrictive standards for women. Ruha, however, is a good aversion to this trope. She’s strong and independent, but won’t rebel in ways that would bring shame to her family or harm to her tribe because she shares the same cultural mores as the rest of her people. It makes the culture feel more realistic when you see that, like all of us, Ruha is a product of her upbringing. I was initially expecting precious little from Lander, our Lawrence stand-in. I figured that either he’d be a clone of Lawrence in personality as well as role (if you’re going to steal one thing, why not steal everything? ), or he’d be some sort of boring colonial beefcake hero like Halloran from the Maztica trilogy. I was pleasantly surprised to discover that he’s neither; he’s clever but fallible, commits many a social blunder, and would much rather be home in Sembia than having adventures in Anauroch. Unlike Lawrence, he doesn’t romanticize the desert, the nomads, or the violence. He’s just there to do a job, and even though he’s woefully underprepared and out of his depth, he’s still going to do his best. He’s driven by his conscience rather than by ego or the needs of the plot. To my surprise, I found myself actually liking him. Part of the reason this novel works better than I expected is that Ruha is the real protagonist here, not Lander. We see much of the story through the eyes of a Bedine rather than the colonialist pawn who’s come to help them. Her character arc, where she learns to embrace her magic and finds some degree of acceptance among her people, is much more involved and interesting than Lander’s. She’s the one who finally saves the day at the climax, too. And her relationship with Lander is much better handled than what one finds in the usual Pocahontas-style colonial narrative. It’s set up from the very beginning of the novel, takes a long time to mature, and makes sense for her as a character (a young, recently widowed outcast who’s just met the only person who’s ever really accepted her) rather than feeling like the author was forcing them together because destiny says so. Much like Seven Pillars of Wisdom, The Parched Sea lacks much in the way of antagonists. The Zhentarim are mostly a faceless threat, a large army without any individually characterized villains. (There’s one Zhentarim leader who gets a name and a couple of lines, but he’s offscreen for almost the entirety of the novel.) It doesn’t seem to hurt the novel much, though, and I can’t think of a way to put a face on the threat that wouldn’t seem contrived. Sometimes problems are just bigger than “person versus person,” and that’s okay. For some reason the author thought we wouldn’t figure out that they’re bad guys unless he dressed them all in black, though, which feels somewhat insulting. The Bedine characters are a mixed bag. They’re mostly cookie-cutter instances of the stereotypical Western image of the Bedouin: proud, superstitious, warlike, and practical. Few of them get enough development to have distinct personalities aside from “the headstrong guy” or “the wise guy.” That’s one area where I wish Denning had taken more pointers from Lawrence — his Arab characters may have been romanticized and rather fictionalized, but they were unique and burst off the page. The main exception is Ruha’s brother-in-law Kadumi, a young man just coming into adulthood as a warrior. He’s by turns brave, awkward, impulsive, and insecure, and has complicated relationships with the other characters that provide plenty of drama. More well-rounded Bedine characters like him would have been welcome here. The theme here, as in the Maztica trilogy, is colonialism. The Zhentarim are trying to subjugate the Bedine nomads to forge a safe trade route across the desert, and the Bedine tribes are too fractious, superstitious, and sheltered to mount an effective resistance or even understand what’s going on. Naturally, it takes a white man to fix their problems. Ruha does much of the heavy lifting of fighting the Zhentarim with her magic, but Lander is the one who brings the tribes together and repeatedly saves them from disaster with his effective strategies. It’s aggravating, but hardly surprising considering the source material. The colonialism isn’t quite as irritating here, though. The Bedine culture gets a reasonable degree of care and attention, mentioning not only the superficial details of attire and social hierarchy, but also their customs, mores, diet, and beliefs. It’s not as lovingly detailed as the Tuigan culture in Horselords, but it’s a damn sight better than the tourist’s version of Aztec culture in Maztica. It makes the nomads seem more like real people and less like the obligatory backdrop to the colonizers’ stories. I also quite appreciated the Bedine’s unique take on religion. We don’t see too much of it, but they appear to have their own spin on the standard Realms pantheon, with different names for the various gods and different relationships between them. It’s a welcome bit of cultural relativity — their version isn’t depicted as wrong, just different. I wish other authors had done more of that sort of thing, frankly, because it really makes a culture feel richer when it has its own religious customs that suit its needs. It’s not bad. There’s a tendency towards giving setting and character backgrounds in long dumps of exposition at the beginning, but mercifully that trails off after the first quarter-book. There’s the occasional failure of “show, don’t tell,” but we’ve seen plenty worse in previous books. And the setting is explored reasonably well, with Anauroch coming off as an appropriately alien place compared to the rest of the Realms. There are a lot of nice details which show that Denning did some research on desert survival. In particular, I appreciate that the camels aren’t treated like mere sand horses — or worse, sand automobiles. Instead they’re recalcitrant, difficult to manage, and frequently killed in battles or for emergency food. The book employs several actual Arabic words for everyday things like “tent” (khreima), “knife” (jambiya) and “sack” (kuerabiche), but at least they’re worked into the narrative somewhat more subtly than they were in Dragonwall, whose use of foreign words was never less clumsy than “He picked up [an object], which was called a [Chinese word].” It’s nice to see an author learn from past mistakes. So what are we to make of this Lawrence of Anauroch? It may be derivative, but it’s certainly not boring. The characters are much more engaging than I expected and apart from some slow exposition at the beginning, the plot clips along at a good pace. I’m annoyed at seeing yet more fantasy counterpart culture nonsense shoehorned into the Realms, but Denning did an acceptable job on the setting and culture, so it could have been worse. It’s not as memorable as some of the better novels we’ve seen so far, but it’s competent and reasonably entertaining. You know, now that I think about it, I can’t come up with a single fantasy novel off the top of my head which featured desert-dwelling tribes that weren’t ripoffs of Arabic culture. There’s something about the romanticized Western image of the Bedouin that aggressively displaces other ideas. Seven Pillars of Wisdom is actually a surprisingly good book, and one that I’d quite recommend. Sure, it’s full of patronizing colonialism and it’s as much fiction as fact — the man was an inveterate liar whose descriptions of people and events are based more on whim than reality. But as fiction goes it’s a good story, and the prose, while somewhat overwrought, is at least wrought in a style that I particularly enjoyed. There are many lovely turns of phrase, and he had a real genius for describing places in an evocative and beautiful manner.